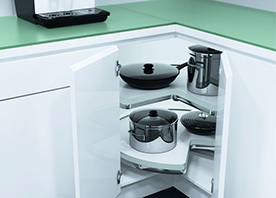 Häfele's corner systems let you maximize storage in hard to reach corner cabinets with our German engineered and manufactured assortment. 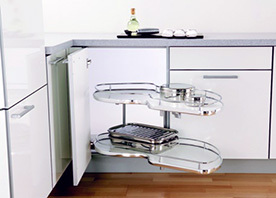 Once installed these accessories make it easy for everyone to access and use this valuable space in your kitchen. 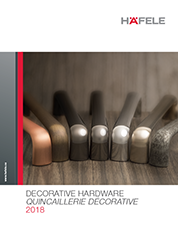 Configurations range from lazy susans to swing-out shelves - in a variety of features. Upon opening, the front baskets automatically swing away, leaving free access to the back basket. 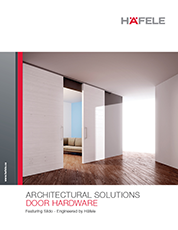 Thanks to 3D adjustment and central height alignment, the Wari Corner© can be fitted perfectly. 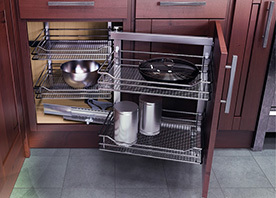 Designed so that the pull out section automatically begins to pivot as the unit is pulled out of the cabinet. 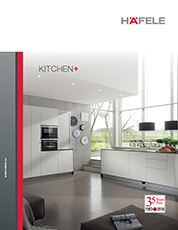 Designed with no central column to give the greatest amount of storage space and with adjustable shelf heights to suit different cabinet heights.